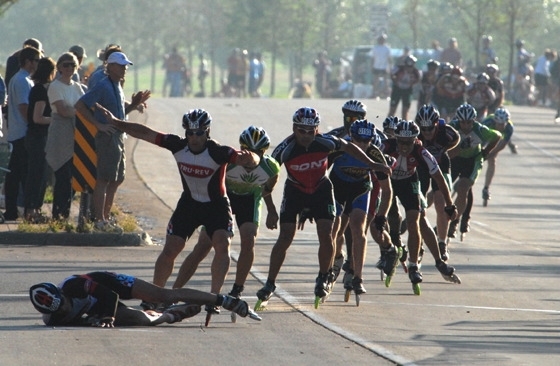 Skater Down - Tru-Rev's Adrian Winchell, 55, hits the pavement at the front of the pro veterans pack. He caught the seam (white line, center) between two road surfaces just past the starting line on the second loop of the racecourse. Skating just behind him, teammate Greg Major (hands in the air) somehow stayed on his feet. "I ran right into his legs and kind of pushed him out of the way," he said. After the fall, the pack slowed down for a while to give Winchell a chance to catch up. Which he did, eventually finished 7th among the pro veterans.